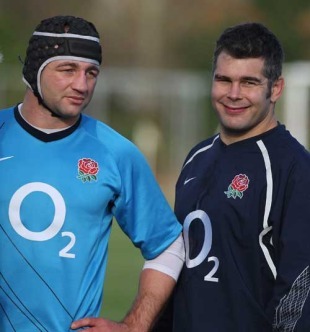 Nick Easter believes that Steve Borthwick is the right man to lead England into this year's Six Nations. Borthwick has led his country in every game since Martin Johnson took charge but the England boss declined to confirm him as his captain when he announced his 32-man squad for the Championship last week. However, Easter, who has been linked to the role, has played down the speculation and backed his Saracens rival to continue as skipper. "It is flattering that people think of you in that light but I would give Steve my backing for the captaincy," Easter told PA Sport. "Steve is a tremendous captain. He brings so much intensity and professionalism to every training session. When he says something he isn't just saying it for the sake of it." England brought the curtain down on another disappointing autumn campaign with defeat at the hands of New Zealand and as a result Borthwick's position, and that of Johnson and his coaching staff, has come under scrutiny. But Easter, who missed the end of year internationals with a calf injury, defended his captain's credentials. "He was under pressure in the autumn but we didn't have many players available. We just lost to New Zealand and beat Argentina in the last two games, he said. "Steve played some of his best rugby for England in the last two games as well. He has been captaining Sarries well this season. They've been there or thereabouts at the top of the league and I think he's a natural leader." The injury woe that plagued England's preparations in November have now eased significantly, and Johnson will have the likes of Lee Mears, Riki Flutey and Toby Flood available when their Six Nations campaign kicks off at Twickenham against Wales next month. Easter, , believes the Six Nations will be a perfect litmus test to see how far England have come under Johnson. "The players and the management have this belief that now is the time to deliver," Easter said. "There's not long to go to the World Cup now. It's just over 18 months away. This is a bona fide competition where results matter, it's outcome-driven and there's a trophy to play for which is ultimately what happens in a World Cup. "It's not a knockout tournament but if we are to set standards and to be the world's best then we have to conquer our hemisphere first of all and we can only do that by winning the Six Nations. It will be mightily difficult but we can do it." Easter is expecting an explosive encounter when England kick off their campaign against Wales at Twickenham on February 6. "It will be one hell of a match," said Easter. "They've had the wood on us over the last three years in the Six Nations so we owe them one. There's a lot of mouth-watering fixtures out there but England-Wales is always one that gets the juices flowing from both sets of supporters as well as players."